That iconic symbol of L.A., that towering beacon of the American West, that emblem of paradise—the palm tree is missing. Imagine the sprawl without them now and you may question the city&apos;s identity, but they weren&apos;t always a part of the landscape. In fact, this used to be a city of shady pepper trees. 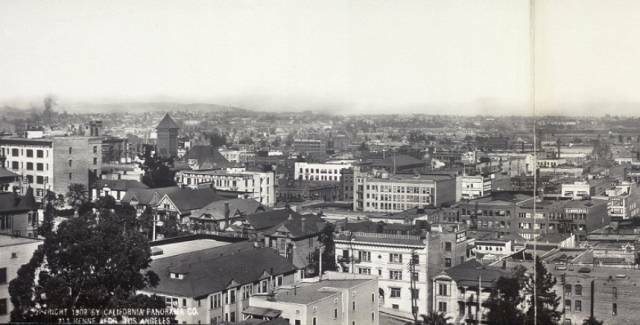 A couple of years back, environmental historian Jared Farmer told KCET: "A century ago, the iconic street tree of Los Angeles was not any kind of palm, but the pepper tree (Schinus molle)... This tree served as Southern California&apos;s answer to the weeping willow. Today, I bet most Angelenos wouldn&apos;t be able to pick one out from a line-up of trees." So how did they get here? Palm trees were exotic, a symbol of far away lands—they were even added in to images of New York City and painted on to movie backdrops—and as the fantasy land of Hollywood grew, so did their presence. While their numbers were nowhere near what they are today, some were being planted in the late 1800s, but they were still a much more unique sight around the turn of the 20th century. It is probable that nothing in Southern California attracts the attention of the tourist and sightseer more, or appeals more to his sense of the beautiful, than do the hundreds of fan-palm trees that are to be seen growing along almost every walk and drive and in nearly every garden, for nothing savors more of the tropical Orient than do these ever-green, thorn-ribbed trees whose hemp-fringed leaves shiver and quake at the least suggestion of a breeze, as though living in constant fear of Jack Frost, even here in California where cold has no place. 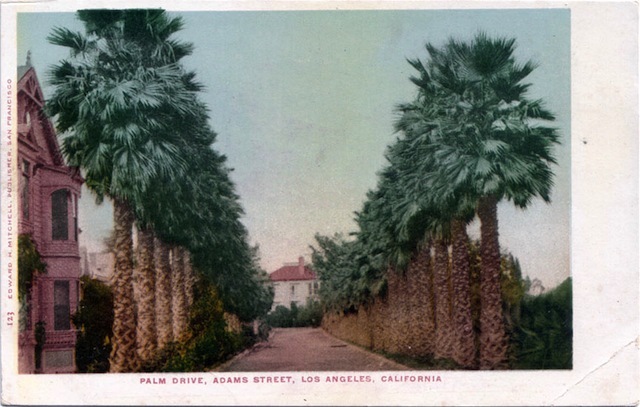 In truth, most photographs from that time were of Palm Drive (you can still see them now next to what is the Orthopaedic Hospital on W Adams Boulevard). But it was undeniable that a palm tree seed had been planted in the minds of Los Angeles&apos;s canvas painters, and it grew to become a very real symbol of SoCal&apos;s cultural iconography. As noted by Nora Mueller, "the rise of Hollywood ushered in the city&apos;s aura of glamour and luxury. Many Hollywood films featured Middle Eastern locales, further imbuing Los Angeles with an exotic, &apos;dangerous&apos; appeal. Just as the Victorians had allowed themselves to be seduced by their own constructions of Orientalism, so too did more modern Los Angeles residents fall under the embellished foreign allure of the palm tree." Transplanted to the so-called temperate zone, tropical palms could be domesticated. In royal botanical gardens and private greenhouses, cultivated fronds provided aesthetic escapism. In the 1840s Kew Gardens built the world&apos;s largest steel-and-glass greenhouse and amassed an unrivaled palm collection. Many wealthy collectors subsequently built smaller versions of the Palm House at Kew. Palms began to signify wealth and luxury as well as tropicality. The tourism industry of the Victorian era added more associations—leisure and fun. In a series exploring the palm tree roots (sorry) here, the Los Angeles Review of Books also spoke of their glamorous appeal: "Palms were useful in selling Hollywood as a new Mecca, just as they had sold Los Angeles as a desert Eden; the desert realm turned up often in early films in which desert sheiks seduced virtuous-turned-lusty maidens. In the same way, Los Angeles went from Victorian virtue to Hollywood vice: sexiness on screen was an instant hit, and the earliest film fantasies came from the hot, palmy desert." 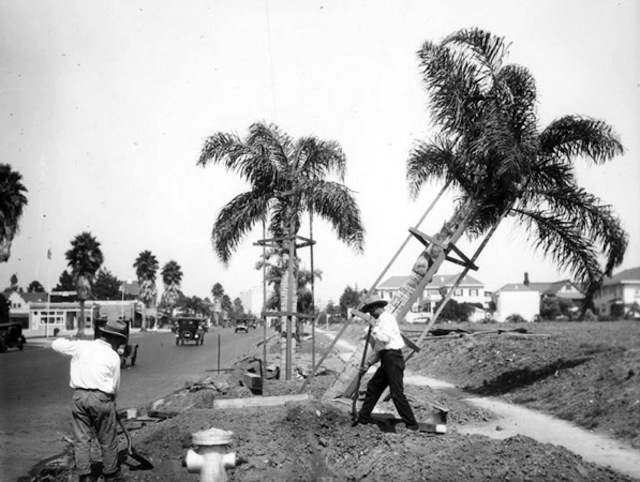 And so the palms slowly replaced the peppers, and in the 1930s Los Angeles saw its biggest boom in palm planting, as the city&apos;s modern boulevards were being built. At this time, the newly established Division of Forestry was looking for a new street tree, and while some believe the palms were brought in to impress visitors at the 1932 Olympic Games, a 2011 KCET article notes that "the $100,000 program that planted some 40,000 trees in total was part of a larger unemployment relief program. Beginning in March 1931, the city put 400 unemployed men to work planting trees alongside 150 miles of city boulevards. Mexican fan palms—then costing only $3.60 each—were spaced 40 to 50 feet apart." 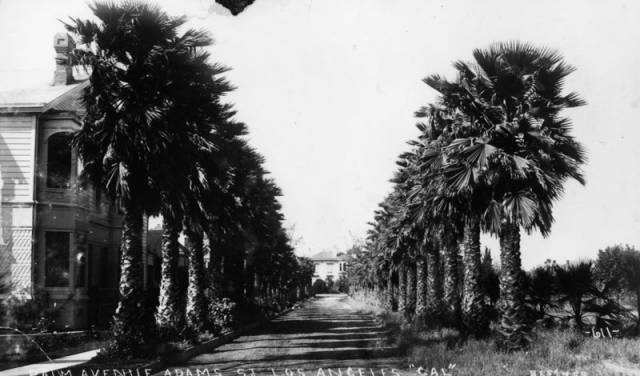 Want to find L.A.&apos;s oldest standing palm tree? 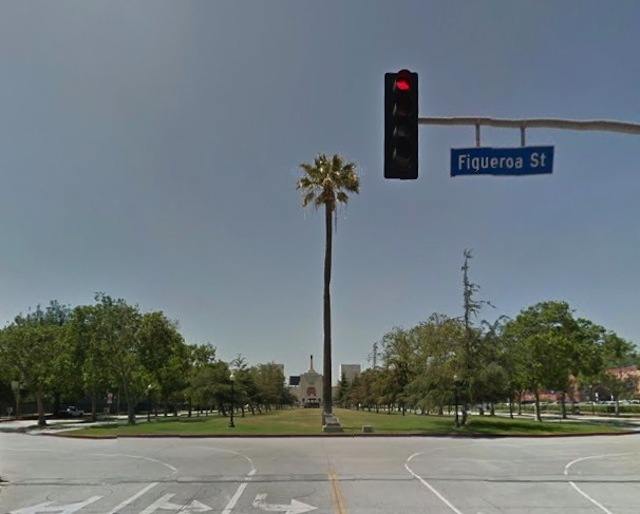 It&apos;s believed to date back to the 1800s, when just a few were standing, and can be found, standing alone and tall, near the Coliseum in Exposition Park, by the Figueroa Street entrance. Nathan Masters took a deep dive into the tree&apos;s history in 2013, and believes the fan palm was "transplanted originally from a desert oasis sometime in the middle of the 19th century." 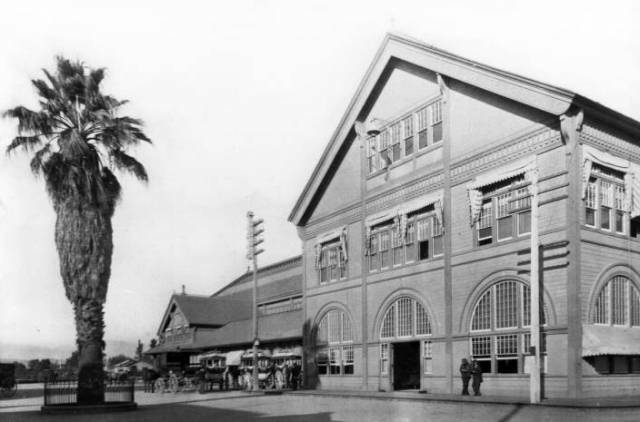 The plaque in front of it reads, in part: "This historic palm tree stood for more than twenty-five years at the entrance of the Southern Pacific Station. At this railroad portal of the city it became a familiar landmark to many thousands of Los Angeles and Southern California citizens and visitors from elsewhere, and was a mute witness to the growth of Los Angeles." When a new Arcade Station was built, the tree was transplanted: "On September 5th, 1914," the plaque reads, "it was placed here. Where it and its sentimental associations will be permanently preserved." So there you have it: aspirational early settlers of Los Angeles used a little imagination to create the landscape you see today—the city is one giant backlot, and the palm tree its most convincing prop.